What does it take for a nation to become a bustling center for international trade? Ricardo Hausmann, professor of the practice of economic development and director of Harvard’s Center for International Development, has determined that countries with economies that are more complex—those with the most skills and capabilities—will be able to produce the greatest diversity of goods, and therefore become wealthier through success in international trade (see “Complexity and the Wealth of Nations,” March-April 2010, page 8). Now, Hausmann and postdoctoral fellows Andrés Gómez-Liévano and Oscar Patterson-Lomba are applying a similar framework to determine the factors that enable a city to become a technological hub—or the scene of an outbreak of sexually transmitted disease. 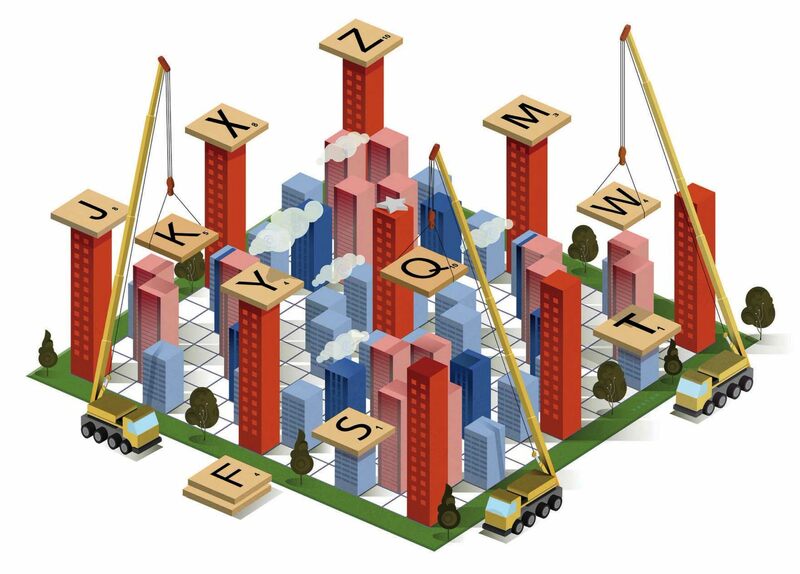 Their model for urban outcomes, surprisingly, is something many families have in their cupboards at home: the game of Scrabble™. Hausmann’s research helps to explain why various social phenomena have taken root in certain cities across the United States and elsewhere, and not others. The film industry, for example, did not develop in Tulsa, but rather in Los Angeles, because producing a film requires skills from scriptwriting to video editing to special effects—a range of talents, Hausmann notes, less likely to exist in smaller cities, which tend to be less diverse. While it might seem simplistic to say that Boston is a mecca for tech start-ups (there are nearly 5,000 within city limits, according to AngelList)—because it has the venture capitalists to provide funds for new companies; state-of-the-art legal support; and employees with the technological know-how to get a product up and running—the model goes a long way toward predicting what can or cannot take place in a given setting without adding or subtracting a key ingredient. The model is powerful in that it can give civic leaders a way of thinking about the best path to regional economic development—or the savviest strategy for fighting a public-health emergency. For example, the prerequisites for high prevalence of sexually transmitted diseases include a dense social network, subpar health services, and anonymity (it is easier, Hausmann says, for people to act in irresponsible ways when they feel anonymous in a big city, compared to the relatively more intimate nature of a small town or village). Identifying ingredients leads to opportunities for intervention; lack of education about drug use, for example, can be a critical factor that leads to substance abuse. Though the complexity of the conditions necessary to create these phenomena might suggest that it is impossible for smaller cities to distinguish themselves in the arts or as centers for groundbreaking medical research, Hausmann and his colleagues determine that a more homogenous society (despite possessing fewer letters) might have an easier time agreeing on how things should be run. “People don’t expect the same things from governments when there is socioeconomic and cultural diversity, and it can be more difficult to get things done,” says Hausmann. From a policy perspective, city governments can implement a number of policies to attract people with new skills, occupations, and ambitions that are critical to the development of different social phenomena. Thus a city could encourage immigration by making foreigners feel safer and more welcome, while simultaneously using education to neutralize xenophobia among current residents (Hausmann cites research indicating that foreigners are much less likely to commit violent crimes, for example). Still, merely attracting new talents isn’t enough to totally transform a city: “You need multiplicative increases in the size of a city to get just additive increases in its diversity,” says Gómez-Liévano. The ability to retain those newcomers continues to be a major reason that cities like New York thrive in industries like finance and technology, while Detroit and Cleveland lag behind. One of the researchers’ aims is to see their findings used as a predictive tool by civic leaders. Cities seeking to anticipate and remedy negative phenomena like drug abuse and poverty could identify the presence of the necessary conditions. Raising awareness of the kinds of social factors to look out for, the researchers hope, is a critical step in making these kinds of policy decisions.